§ 302. The flourishing of literature, which marks the second half of the 14th c., apart from its cultural significance, testifies to the complete reestablishment of English as the language of writing. Some authors wrote in their local dialect from outside London, but most of them used the Lon­don dialect, or forms of the language combining London and provincial traits. Towards the end of the century the London dialect had become the principal type of language used in literature, a sort of literary "pat­tern" to be imitated by provincial authors. The literary texts of the late 14th c. preserved in numerous manu­scripts, belong to a variety of genres. Translation continued, but origi­nal compositions were produced in abundance; poetry was more prolific than prose. This period of literary florescence is known as the "age of Chaucer", the greatest name in English literature before Shakespeare. Other writers are referred to as "Chaucer's contemporaries". § 303. One of the prominent authors of the time was John de Trevisa of Cornwall. In 1387 he completed the translation of seven books on world history — POLYCHRONICON by R. Higden — from Latin into the South-Western dialect of English. Among other information it contains some curious remarks about languages used in England: "Trevisa: ... gentle men have now left to teach (i. e. "stopped teaching") their children French... Higden: It seems a great wonder how Englishmen and their own language and tongue is so diverse in sound in this one island and the language of Normandy coming from another land has one manner of sound among all men that speak it right in England... men of the East with men of the West, as it were, under the same part of heaven, accord more in the sound of their speech than men of the North with men of the South." Of greatest linguistic consequence was the activity of John Wyclif (1324—1384), the forerunner of the English Reformation. His most im­portant contribution to English prose was his (and his pupils') transla­tion of the BIBLE completed in 1384. He also wrote pamphlete protest­ing against the corruption of the Church. Wyclif's BIBLE was copied in manuscript and read by many people all over the country. Written in the London dialect, it played an important role in spreading this form of English. § 304. The chief poets of the time, besides Chaucer, were John Gower, William Langland and, probably, the unknown author of SIR GAWAINE AND THE GREEN KNIGHT. The remarkable poem of William Langland THE VISION CONCERNINGPIERS THE PLOWMAN was written in a dialect combining West Midlandand London features; it has survived in three versions, from 1362 to 1390; it is an allegory and a satire attacking the vices and weak­nesses of various social classes and sympathising with the wretchedness of the poor. It is presented as a series of visions appearing to the poet in his dreams. He seesdiverse people and personifications of vices and virtues and explains the way to salvation, which is to serve Truth by work and love. The poem is written in the old alliterative verse and shows no touch of Anglo-Norman influence. John Gower, Chaucer's friend and an outstanding poet of the time, was born in Kent, but there are not many Kentisms in his London dia­lect His first poems were written in Anglo-Norman and in Latin. His longest poem VOX CLAMANTIS ("The Voice of the Crying in the Wil­derness") is in Latin; it deals with Wat Tyler's rebellion and condemns all ranks of society for the sins which brought about the terrible revolt. His last long poem is in English: CONFESSIO AMANTIS ("The Lover's Confession"), a composition of 40,000 octo-syllabic lines. It contains a vast collection of stories drawn from various sources and arranged to illustrate the seven deadly sins. John Gower told his tales easily and vividly and for long was almost as popular as Chaucer. Weshould mention one more poet whose name is unknown. Four poems found in a single manuscript of the 14th c. — PEARL, PATiENCE, CLEANNESS and SIR GAWAINE AND THE GREEN KNIGHT — have been attributed to the same author. Incidentally, the latter poem belongs to the popular Arthurian cycle of knightly romances (see § 293), though the episodes narrated as well as the form are entirely original. The poems are a blending of elaborate alliteration, in line with the OE tradition, and new rhymed verse, with a variety of difficult rhyme schemes. § 305.Geoffrey Chau­cer (1340-1400) was by far the most outstanding figure of the time. A hun­dred years later William Caxton, the first English printer, called him "the worshipful father and first founder and embel­lisher of ornate eloquen­ce in our language." In many books on the his­tory of English litera­tureand the history of English Chaucer is de­scribed as the founder of the literary language. Chaucer was born in London about the year 1340 and had the most varied experience as student, courtier, official, and member of Parlia­ment. His early works were more or less imitative of other authors — Lat­in, French or Italian — though they bear abundant evidence of his skill. He never wrote in any other language than English. The culmination of Chaucer's work as a poet is his great unfinished collection of stories THE CANTERBURY TALES. The Prologue of (his poem, the masterpiece of English poetry, describes how the poet found himself at the Tabard lnn, in Southwark, bound on a pilgrimage to the shrine of St. Thomas Becket at Canterbury. There he met twenty-nine other pilgrims, who, at the suggestion of the host, agreed to liven up the journey by story-telling. Chaucer lived to write only twenty-four stones out of the intended sixty, but in the Prologue he managed to give a most vivid picture of contem­porary England: he presented in the pilgrims a gallery of life-like portraits taken from all walks of life. In social position they range from knight and prioress to drunken cook and humble plowman — a doctor, a lawyer, a monk, a sailor, a car­penter, an Oxford scholar and many others. These people are shown as they ap­pear on the road, with their distinctive dress and features, and with a bit of their personal history. Even in their choice of tales they unconsciously reveal themselves, the stories being in harmony with the character of the narrators (e. g. the knight relates a story of chivalry). 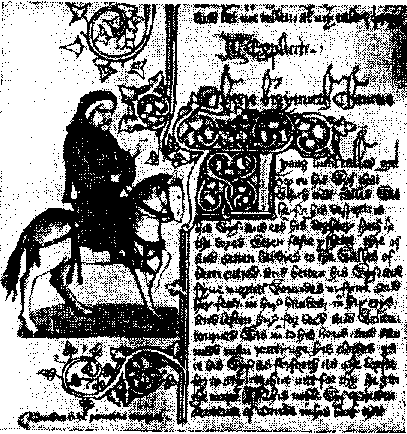 Chaucer wrote in a dialect which in the main coincided with that used in documents produced in London shortly before his time and for a long time after. Although he did not really create the literary language, as a poet of outstanding talent he made better use of it than his contem­poraries and set up a pattern to be followed in the 15th c. His poems were copied so many times that over sixty manuscripts of THE CANTER­BURY TALES have survived to this day. His books were among the first to be printed, a hundred years after their composition. Chaucer's literary language, based on the mixed (largely East Mid­land) London dialect is known as classical ME; in the 15th and 16th c. it became the basis of the national literary English language. § 306. The 15th c. could produce nothing worthy to rank with Chau­cer. The two prominent poets, Thomas Hoccleve and John Lydgate, were chiefly translators and imitators. The style of Chaucer's successors is believed to have drawn farther away from everyday speech; it was highly affected in character, abounding in abstract words and strongly influenced by Latin rhetoric (it is termed "aureate language"). § 307. Whereas in English literature the decline after Chaucer is apparent, the literature of Scotland forms a happy contrast. The Scot­tish language, which grew from a Northern dialect of English flourished from the 13th until the 16th c. THE BRUCE, written by John Barbour between 1373 and 1378 is a national epic, which describes the real his­tory of Robert Bruce, a hero and military chief who defeated the army of Edward II at Bannockburn in 1314 and secured the independence of Scotland. This poem was followed by others, composed by prominent 15th c. poets: e. g. WALLACE attributed to Henry the Minstrel; KING'S QUHAIR ("King's Book") by King James I of Scotland.